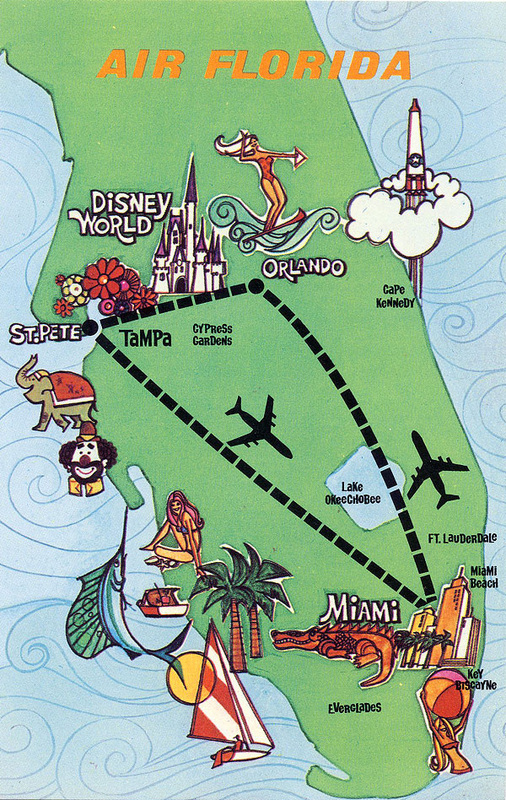 The first two postcards seen here were most likely printed around the time Air Florida began flying in September 1972. At that time, they operated Boeing 707s between Miami, Orlando and St. Petersburg. These were sent in by Fred. Thank you sir! September 1, 1978 route map. Courtesy of Arthur Na. Route map from February 1, 1979. 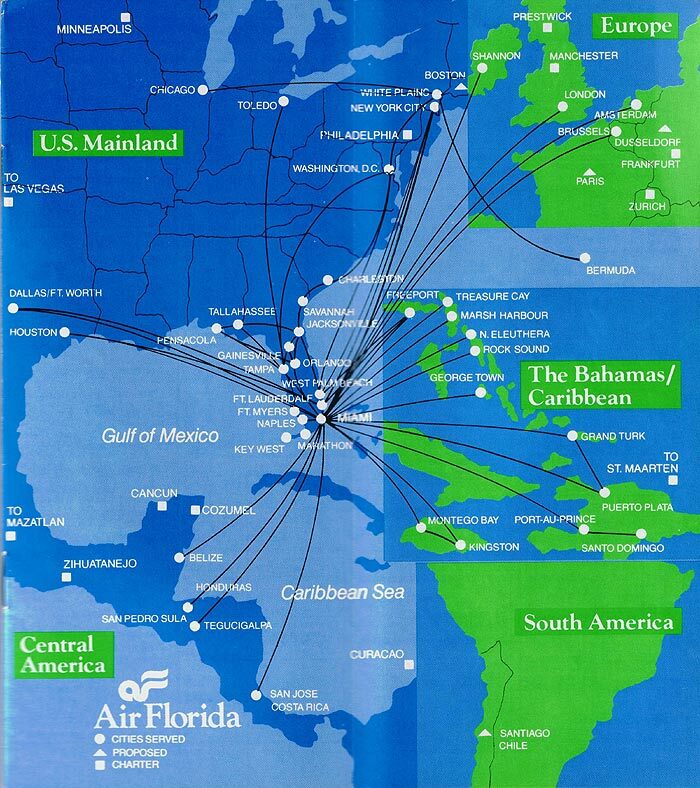 Air Florida purchased Air Sunshine on December 1, 1978, gaining access to Key West and Marathon. 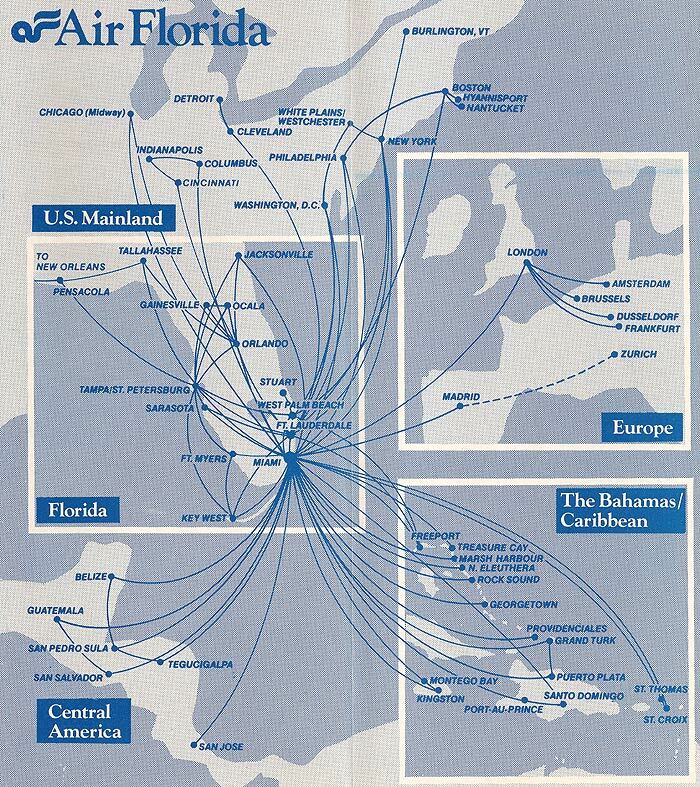 July 1, 1981 - DC-10s to Europe! 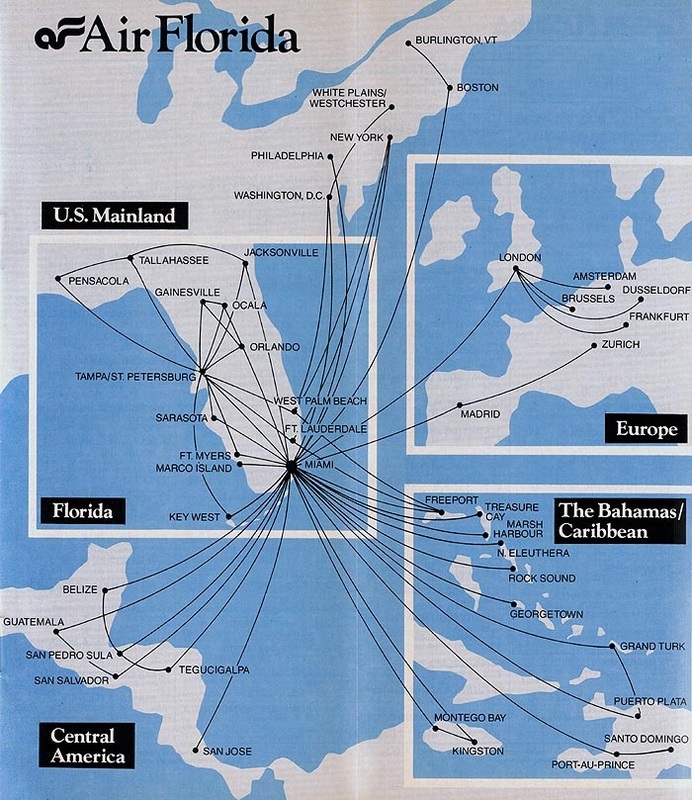 The Air Florida Commuter system was in full swing by 1981 and carriers included: Florida Airlines (Martin 404s to Key West, Ft. Myers, Miami and the Bahamas) and North American (CASA 212s to the Keys, Bahamas, Miami and southwest Florida). 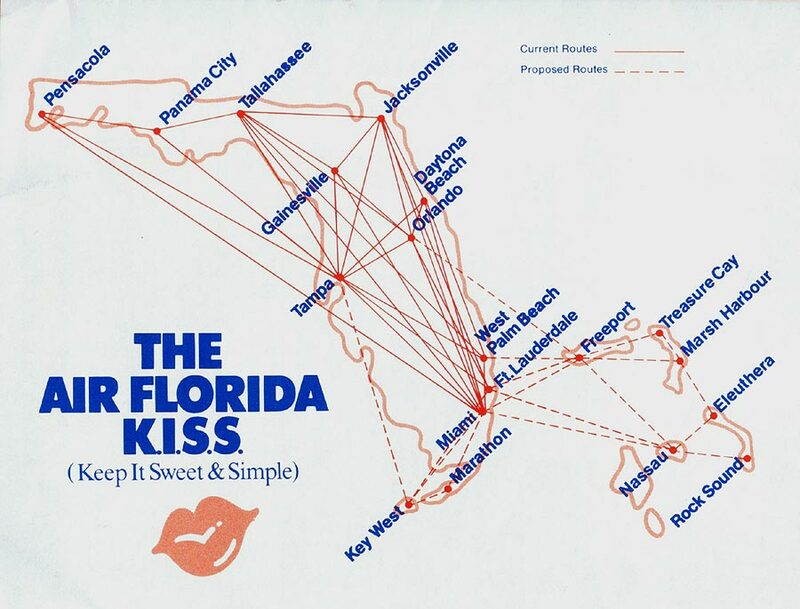 April 15, 1983 - ﻿Air Florida Commuter﻿ carriers at that time included Marco Airways (Martin 404, Piper Navajo), Skyway of Ocala (Beech 99, Piper Navajo) and National Commuter (Nord 262). January 15, 1984 - Apparently the last timetable issue printed by Air Florida. 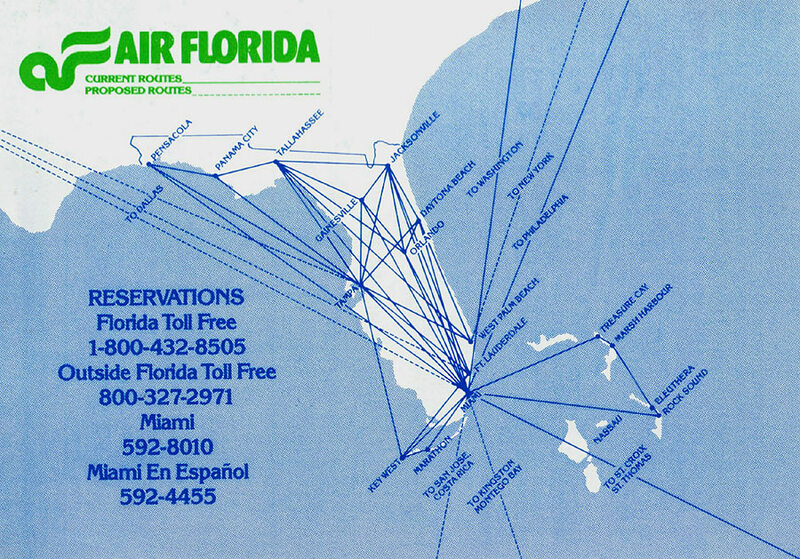 By 1984, almost all intrastate flights were conducted by Air Florida Commuter carriers. Skyway handled flights to Ocala and Gainesville, Gull Air operated most of the flights in south Florida, while longer segments (MIA-JAX, TPA-PNS, TPA-TLH, etc) were operated with Convair 580s leased from Key Air and Frontier.